A fairy party is a popular as a child birthday party idea and a great source of girl games. Many ideas on this list come from what little girls love to do - play dressup, and use their imagination! 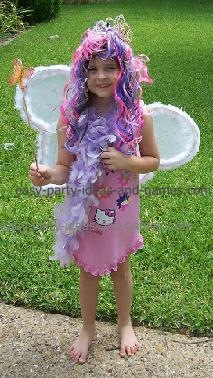 Fairy parties can also be about fairies in general, follow a garden theme, or be about a specific fairy, such as Tinkerbell or one of the Barbie Fairytopia fairies. Here are some fun, general, party activities that you can do for any of these different type of fairy themes! It is always a good idea to have something for your little guests to do when they get to the party, because there is about a 10 minute time span where people are arriving and you will want to have everyone occupied from the moment they get there. Have a helper, either another adult or an older child, help with these activities to free you up to answer the door. As guests arrive for the party, give them a "fairy makeover". Nail polish, body glitter, glitter hairspray. You can add a tulle skirt, crown and wings if you wish. Make fairy wands as a craft. Make fairy crowns as a craft. One option on the wings is to wait to pass out the wings till the end of your party. If you do this, you can set up the games as "tasks" to complete so each child "earns" their fairy wings. Centering a party around "earning" something can give you a wealth of activities! How about your fairies-in-training trying some of these activities? Speed Test: Have a race or a relay race to see who can zip among the flowers the fastest. Magical Hunt: Arrange a treasure hunt where everyone must find 3 beautiful colored jewels. Show of Bravery: How about winning a battle against a villian? It is always a good idea to be able to stand up for yourself and your fellow fairies. 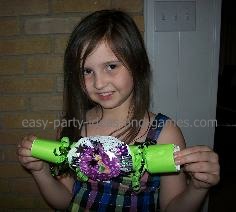 For more kids party games, visit our huge listing page of easy kids games. Make tissue paper flowers (great as decorations too). Make fairy houses out of nature materials. Make tissue paper butterflies. (also great as a decoration). Make fairy dust as a craft - or give it as a party favor. 1 scoop of sugar mixed with 4 sprinkles of glitter will do the trick! Go on a fairy scavenger hunt. Because fairies love to live in gardens, you can incorporate some of the ideas from a garden party into your theme! One good idea would be to hit a flower or butterfly pinata. Thanks to my friend Lisa for this idea. For her party they had "fairy crackers". They are like the Christmas crackers popular in the U.K. that are filled with little treats and trinkets - fill by adding your own fairy items and decorating. Be sure to serve a themed fairy party cake!